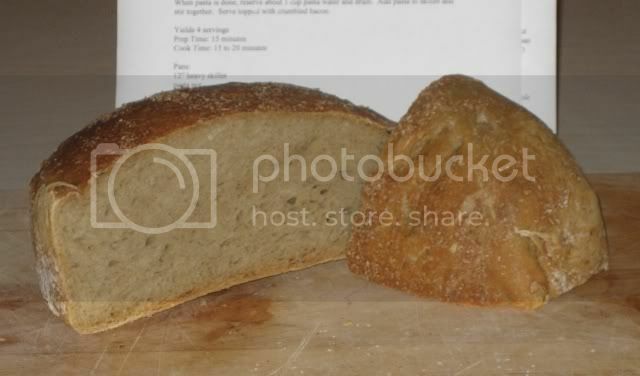 This is the bread I baked yesterday, using half and half whole wheat and white flour. It barely rose, though got a little oven spring. But it isn't a brick! The flavor is very good and the crumb is nice and soft. I think I overproofed by about 2 hours, but may have the other elements right. 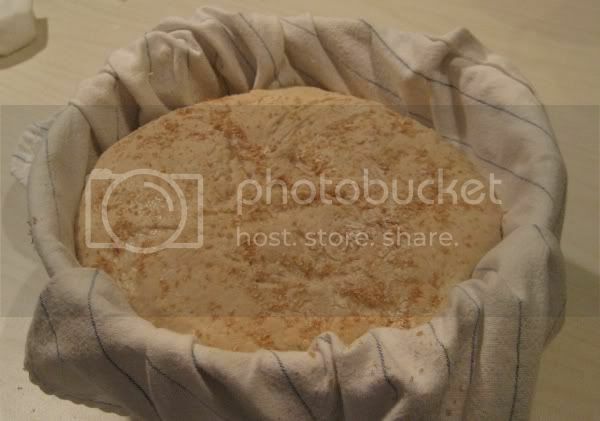 Here's the dough just before going in the oven. The gluten strands on the dough surface didn't hold when I rounded the dough. You can see how torn up it looks. I stopped shaping because I was making it worse with each little stretch. Would the overproofing account for that? Quite a contrast to my last dough pic, isn't it! It's not well-risen, but it passed the finger-stick test, so in the oven it went. I didn't think it would take a free-form bake, so used my 4 quart saucepan for baking it. Once the dough is losing it like this, is there any way to return it to a nice plump state that holds together? It actually has risen some in the colander since I shaped and placed the dough there, but the dough seemed rather torn up, and further rounding was just making it worse. I should clarify that the overproofing seemed to be in the 18 hour stage. The dough seemed a bit liquid in the center when I dumped it out on the board. Thanks Annie. I increased the water because of the whole wheat flour. Do you use 1-1/2 cups water with whole wheat flour? I started another whole wheat loaf tonight. I'll watch the timing on it a bit better. I hope to eventually get a 100% whole wheat loaf with this method that we like. I like that video. It's nice to see the technique. Annie, Good luck with your spelt. That's one flavor I look forward to trying sometime down the road. My latest whole wheat turned out much nicer, though still not as great as the white flour version. I need to recharge my camera battery so I can get a new photo up. Annie, glad it turned out so well. July 22, 2007 - Help! My Spelt went Splat!